Jug Jaw’s Beat Club – Big Alabama, Delay, Lank Smith and the Pythons, at Bedfords Crypt, Norwich, 15 May 2014. Review and photos. A welcome quick return for Jug Jaw’s at a loud, hot and steamy Crypt in beat club mode, before Chris and Steph take to the road with Kill It Kid, so probably the last one for a few months. Happening during the Festival, I was speaking with a friend who had invited some of his friends up from London and they were apparently blown away by the venue, the bands and the music, and the city … not surprisingly. Lank Smith & the Pythons are a blistering live act, and through this analogue equipment genuinely exciting. I’m not sure how feasible it would be, nor even if they would wish it but I’d love to see them play some headline dates, they are that good and clearly having great fun – they even invited someone from the audience to take over the playing of keys for one song! They must be a hard act to follow though. It fell to Delay to follow them, playing another high energy and loud set, the band sounded terrific and very powerful. Some frenetic drumming saw a lost drumstick leave the drummer’s hand, spinning and arcing through the air before hitting (harmlessly) Steve Howlett square in the face, he joked afterwards that it would have been such a rock and roll way to go! The night’s headliners were Big Alabama, a very loud and noisy duo on guitar and drums, from Diss. The Big Alabama are a two piece rock outfit formed in the outback of Diss, Norfolk. Drummer, Rob and Guitarist and Vocalist, Ryan set upon a venture of writing music that they wanted to play and not what they were told to play in late 2012. With previous bands failing, The Big Alabama decided to take the knowledge that they had learnt over the years to form a duo that would rock anyone to the core. With the debut album in the pipeline and interest already building, these boys will hit you in 2014 with big drums beats and massive rocking riffs that will blow you away. They certainly fulfilled the promises of their bio. Very loud and powerful too and a fantastic way to experience their sound for the first time, at a Jug Jaw’s night in the Crypt. 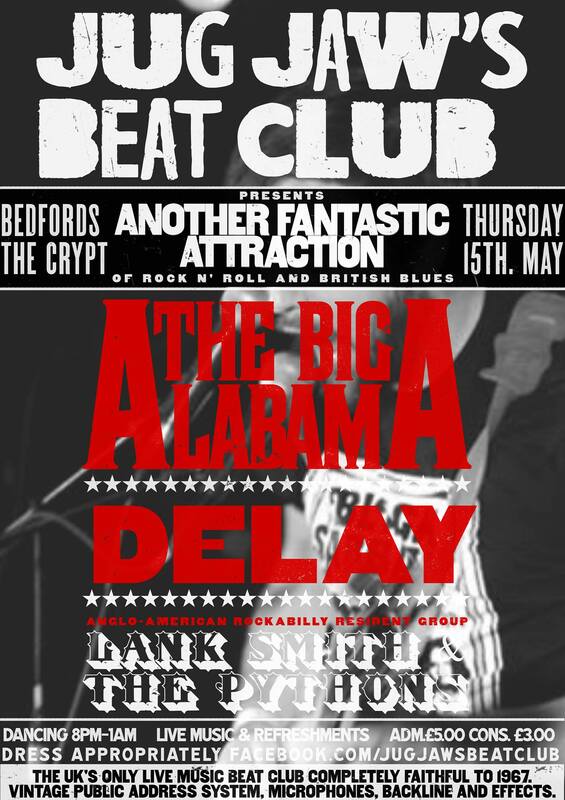 On Thursday May 15th in the bowels of Bedfords Crypt we have without doubt two of the newest and most exciting british rock and blues artists in the East right now. LIKELY TO BE ONE OF THE MOST EXCITING INTIMATE GIGS YOU’LL SEE ALL YEAR! Placing them in a hedonistic beat environment as it would have been in 1967, every detail will be catered for. Cutting edge technology in the form of a ‘Shure Vocal Master Announcement system’ from 1967 will amplify our singers, accompanied by real tape echo units and spring reverb tanks. The stage will be completed with an array of the rarest vintage valve amplifiers, a gold sparkle Del Rey drum set, column speakers, vintage stage lights, persian rugs and beat decor. A truly unique experience. PHAW. First on we have resident anglo-american house band LANK SMITH & THE PYTHONS. Making their stage debut at Jug Jaw’s grand opening the band consists of members of internationally acclaimed KILL IT KID and sad-core-fun-pop troubadours HELLO BEAR. They will host the night performing a selection of hit parade and garage rarities. Then we are delighted to present Delay. Summoning the dark presence of LA troubadours The Doors and the eclectic guitar tones of Jack White, they are not to be missed! Topping the Bill is The Big Alabama. Thunderous riffs and heavy gravel-tone vocals. What more could you want? £5 on the door, £3 for students. Doors 8pm. We need you to make this special, a good audience is just as important as the acts themselves. Please tell your friends and come and support local live music. After Jug Jaw’s we went to Norwich Arts Centre for another late Live Art show, featuring a short art performance in the bar and then a rare set from the absolutely brilliant Girl in a Thunderbolt. It felt strange watching such a late set (about 12:15am) on a Thursday night, and it deserved a bigger audience but those privileged to be there heard Maria play a compelling, fascinating, and musically wonderful set. Using layers and loops the songs built and grew and then we had Maria’s marvellous voice over the top. Currently taking up the challenge of writing and recording an entire album in the month of May, she is a super talent and this performance was a great way to round off another evening in this festival season in the city. This entry was posted in Festival, Jug Jaw's Beat Club, live music and dance and tagged bedfords bar, bedfords crypt, Big Alabama, Delay, girl in a thunderbolt, Jug Jaw's Beat Club, lank smith and the pythons, Live Arts, live music, maria uzor, nac bar, NNF14, Norfolk and Norwich Festival 2014, norwich arts centre, photos, shashamane. Bookmark the permalink.